Zion National Park is a land of enormous stone spectacles seen from many different perspectives throughout the park. The East Temple, named by John Wesley Powell, is best seen from the east side of Zion, along the spiraling Zion-Mt. Carmel Highway. The massive East Temple towers 7110' and rises 2000' from the road. Our East Temple Saddle Route will take you to a spectacular vantage point on the eastern slopes of the East Temple where imposing slickrock prevails. The route begins by following the popular Canyon Overlook Trail to its end, and then climbs steeply toward the north into seldom traveled terrain. This steep, but rewarding hike progresses along a stairway of red and white sandstone, skirting the flank of the East Temple, leading to a hidden play land in the upper east canyon, before finally dropping into the depths of Upper Pine Creek. Equipment: Sticky rubber shoes, plenty of water, sun protection and the USGS 7.5' Springdale east map. 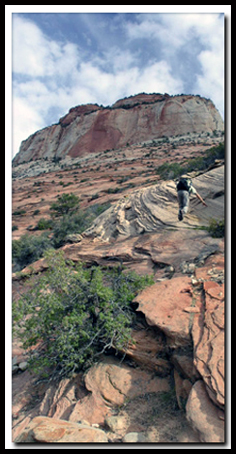 Difficulty: This is a strenuous route where slickrock scrambling is required. Wear proper footwear and do not go unless you are comfortable hiking on steep rock. Trailhead: Canyon Overlook Trail, near the east end of the Zion-Mt. Carmel Tunnel. Best Season: Year-round. If it has rained recently and the sandstone is damp, patches of moss and lichen will be extremely slippery. Do not attempt this hike if snow or ice is present on northern slope. 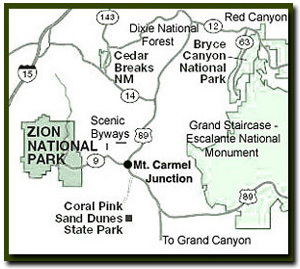 Trailhead: Park at the small lot located on the east side of the Zion-Mount Carmel Tunnel and locate the Canyon Overlook trailhead across the road. The trail ascends a well-beaten path, winding west above Pine Creek for a half-mile and ending at an overlook above the Great Arch. Look north from this point and note the white hoodoos on the east (right) side of the East Temple. The hoodoos provide a landmark to hike toward. Keep in mind, the elevation gain of 1100' takes place in a fairly short distance, so sticky rubber hiking shoes are required. Now is the time to tighten up your laces and begin bearing north, following the path of least resistance. Do not attempt to travel directly toward the hoodoos, but instead zigzag, locating ledge systems, and as always avoid steep and dangerous areas. Cairns, if present, can provide a path to follow, nevertheless pick the easiest route between the rock markers. At the saddle the views of the West Temple, Bridge Mountain, Progeny Peak and Deertrap Mountain are outstanding. Zion Photo: Bo Beck is hiking up slick rock toward the East Temple, and then will drop down into a valley. This route is a loop, so you will not be turning around at this point to head back to the Canyon Overlook Trail. The backside of the saddle exposes a large bowl of trees and slickrock. The easiest path into the bowl is to traverse and descend the ledges, until arriving in a wash that flows east. The total descent to the wash, from the saddle, is 550'. Follow the wash .3 mile to the east, until it abruptly spills into a deep slot canyon below. You are now standing on the edge of a long drop-off and peering into the depths of Shelf Canyon. Turn left (north) and walk along the edge of this small canyon for 100 yards. After arriving at the head of Shelf Canyon carefully contour around its head and gain the slickrock ridge on the opposite side. Follow the ridge back down Shelf Canyon's eastern side until it is possible to descend left (northeast) to the easier terrain below. Try to remain at a constant elevation as you walk north in the direction of the head of Upper Pine Creek. Be aware of the cliff band on the right, which is the east wall of Upper Pine Creek. Examine the wall for the vertically streaked, water stained pour-off. Pick the easiest route down the steep slickrock as it drops down into Upper Pine Creek, about 100 yards upstream of the stain. From here it's a leisurely quarter-mile stroll back to the road, and your vehicle is just another 100 yards or so down the road.